"Kenneth MacMillan brings a contemporary interpretation to Sergei Prokofiev's classic score. His version of the ballet draws out the emotional and psychological intensity at the heart of the tale. 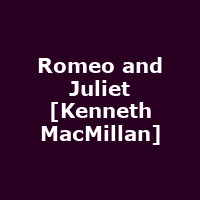 Romeo and Juliet contains three passionate pas de deux: from the lovers' first meeting and the famous balcony scene to the devastating final tragedy. The lovers' story is set against a wonderful evocation of 16th-century Verona: a bustling market place erupts into a violent sword fight and a lavish ball is held at an elegant mansion."